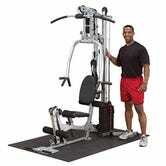 Amazon has dropped the price of the Powerline BSG10X Home Gym with 160-Pound Weight Stack to just $633.95. That's its lowest Amazon price to date by nearly $70 and more than $200 less than the next third-party merchant. If I had the space in my home, I'd trade my YMCA membership for this in a second.